An international friendship forged in the midst of war. Centenary coming up in 2018. Henri lives in the French village of Villers-Bretonneux. Billy lives in Melbourne, Australia. These two boys, who live thousands of miles away from each other, share one story that unites Villers-Bretonneux and Melbourne in history. A moving and inspiring story of World War One. Teacher notes available here, more teaching ideas on my blog here and a unit of work using the book in a Year Five classroom can be found here. 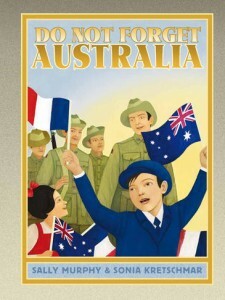 Do Not Forget Australia is an important book for all Australians. It is one that should be on all school, home and public library shelves.